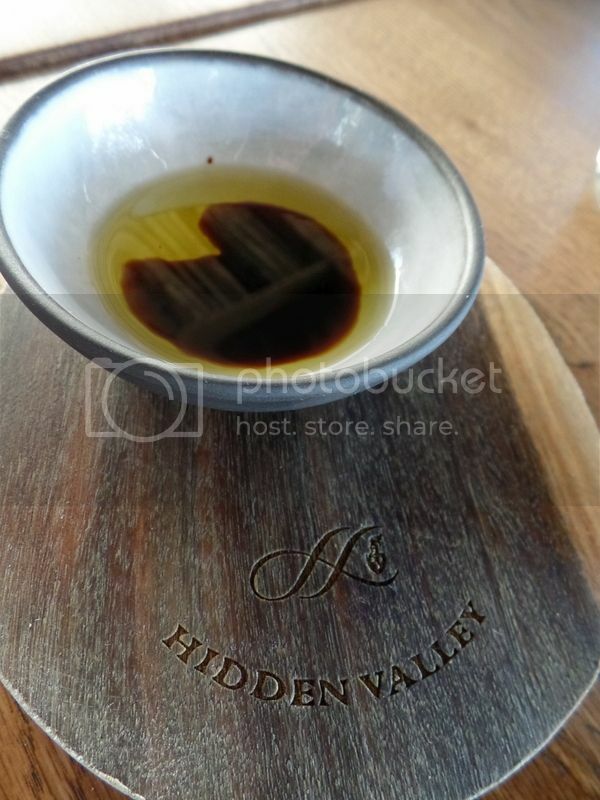 Overture is situated on the foothills of the Helderberg Mountain on the Hidden Valley Wine Estate in Stellenbosch. 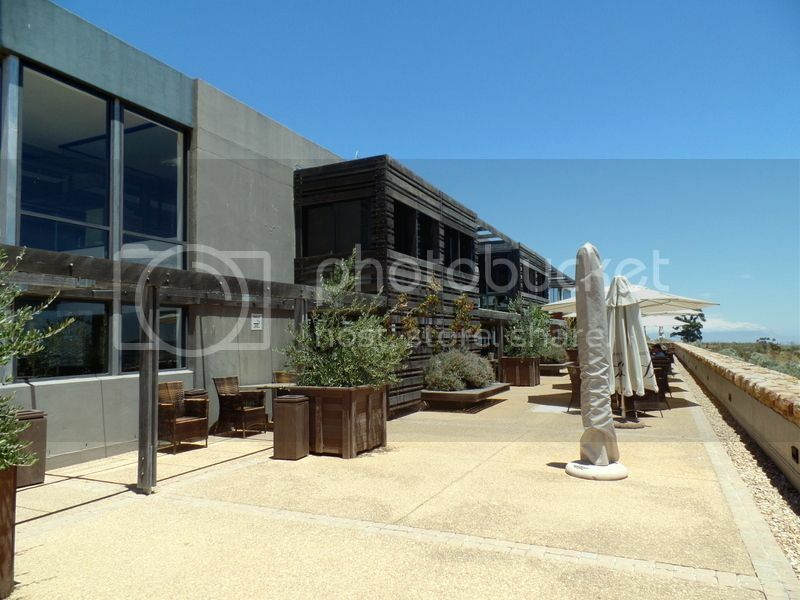 The restaurant opened in 2007 and has been in the Eat Out Top 10 for 6 years running. That is no small feat that list is lethal and restaurants slip off it like children on a slide. I had the absolute pleasure of finally finding out why they deserve this most coveted spot again and again. I think Bertus Basson picks his restaurants by their views. I think he stands outside and says this is beautiful and this is where I will share part of my soul. I truly believe this not only because I’ve seen the view but also because I have tasted his food which must certainly include something magical as an extra ingredient. 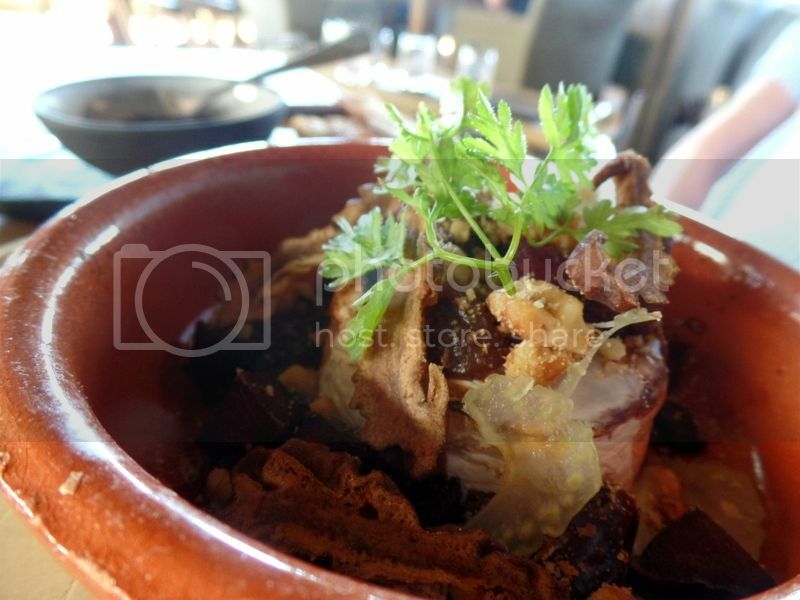 We had lunch at Overture over the festive season and I am finally getting round to sharing it with you! Oh the shame! But Overture is too good not to share – I couldn’t keep this joy just to myself. First things first, the view! When you book, because you will, make sure to grab a table outside as close to the front as possible. We were outside and it was beautiful – but next time I want to be in the front row! It is worth noting that those front row tables overlooking the view would be a gorgeous setting to celebrate a birthday, an anniversary, a new job or a proposal. I don’t think you could say no to anything with that view in front of you. You would think with a view like that the food would have a hard time competing. It doesn’t. The food compliments the view and the view compliments the food. 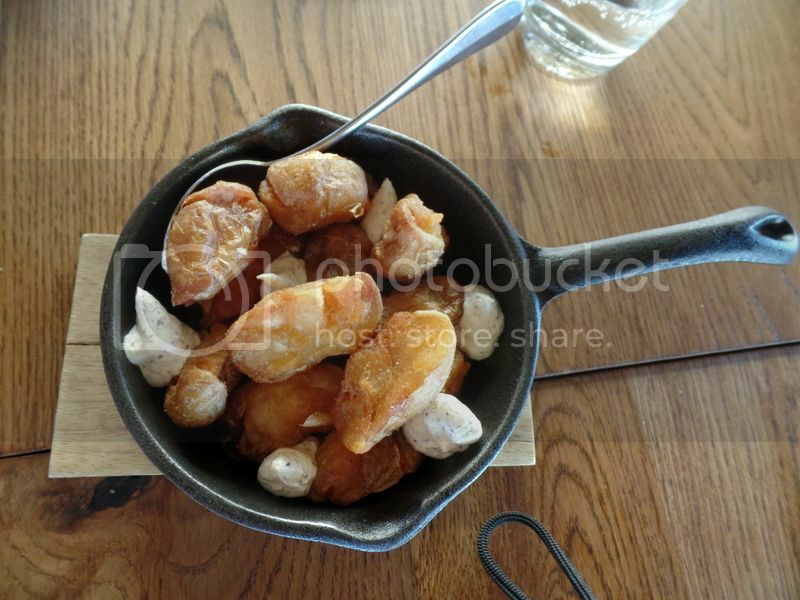 Overture is definitely a fine dining restaurant but there is nothing finicky about this food. Each plate arrives with purpose and colour and comfort. That sounds funny to say comfort but its true. Each plate reminds you of the best Sunday lunch your mama ever cooked. 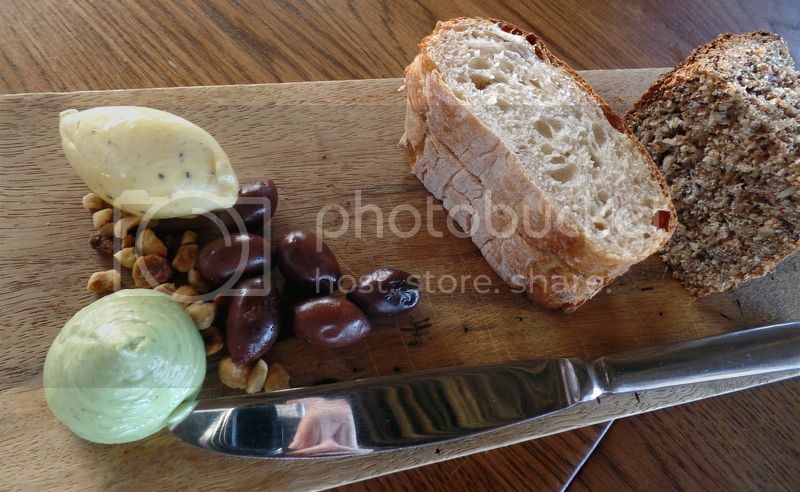 The bread board was the start and included fresh chunky slices of peasant bread and a farm loaf packed with seeds and goodness. The olives were amazing and I pretty much everyone’s share of the olives – too slow my friends! 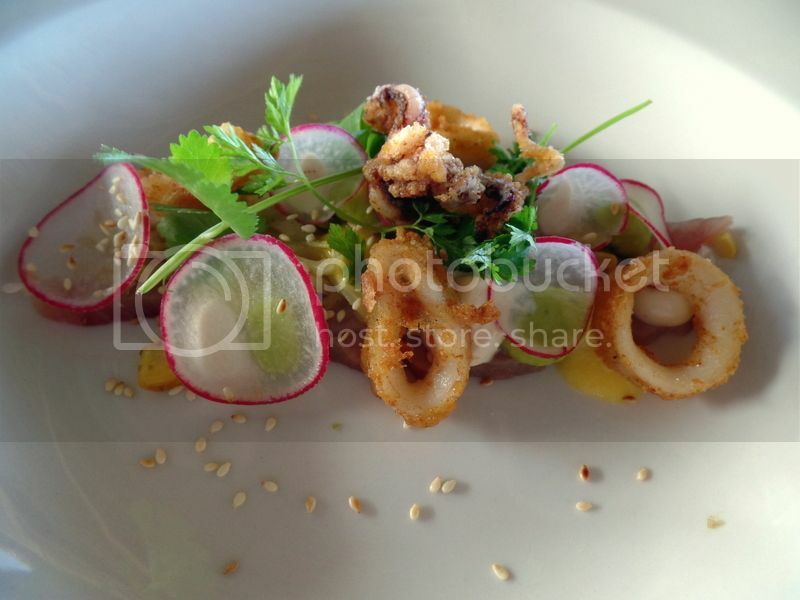 This was our starter of yellow tail and crispy calamari. This was light, beautiful and seriously delicious! 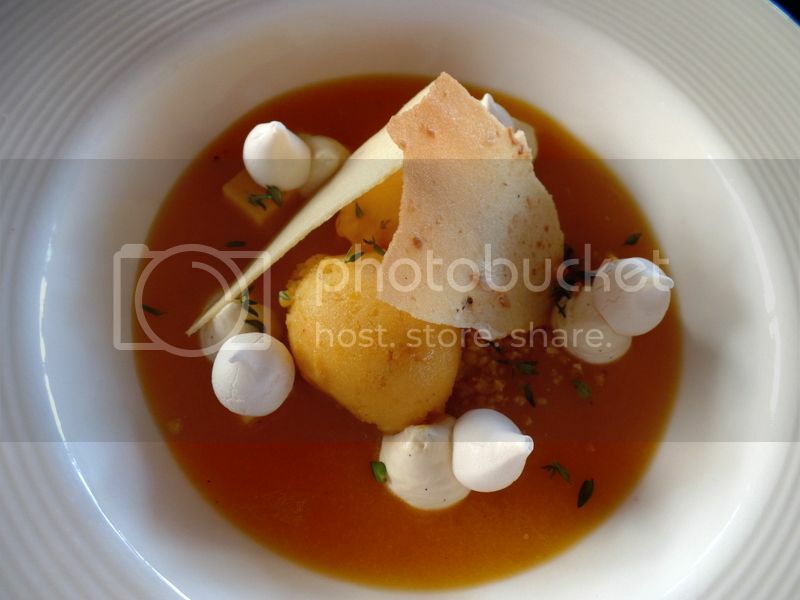 I loved all the flavours and freshness of the dish! We had this fantastic rolled lamb shoulder as a main course. 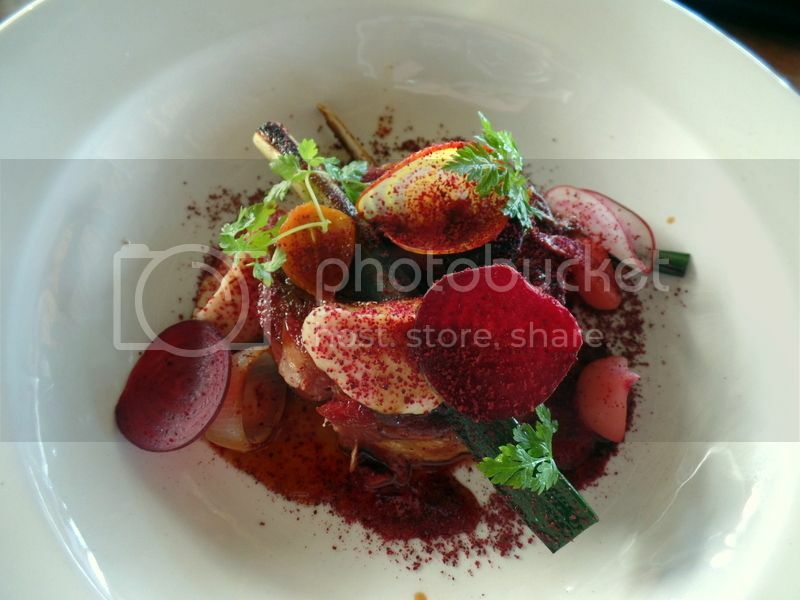 This dish was incredibly tender and was kept fresh and light with the lovely onions and beetroot. Potatoes guys! Potatoes! Look at these spuds! My Irish soul is all a flutter! In my house potatoes are both loved and expected. 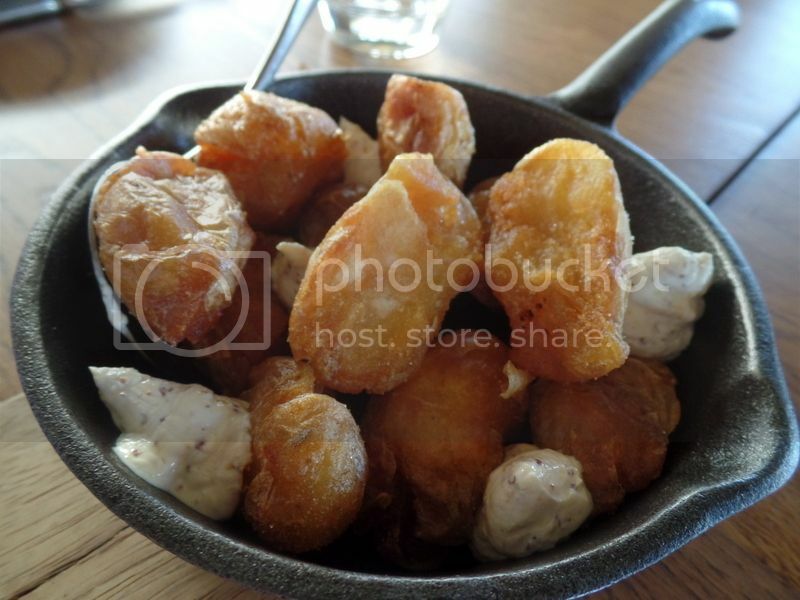 These were incredible roasted potatoes! Soft inside and super crispy on the outside with a Crème fraîche kind of thing that melted on their hot crispy skins! Hello comfort food! These are served for the table with the main course and I’ve got to tell you there were fights and strategic servings over the extra crispy skinned ones! 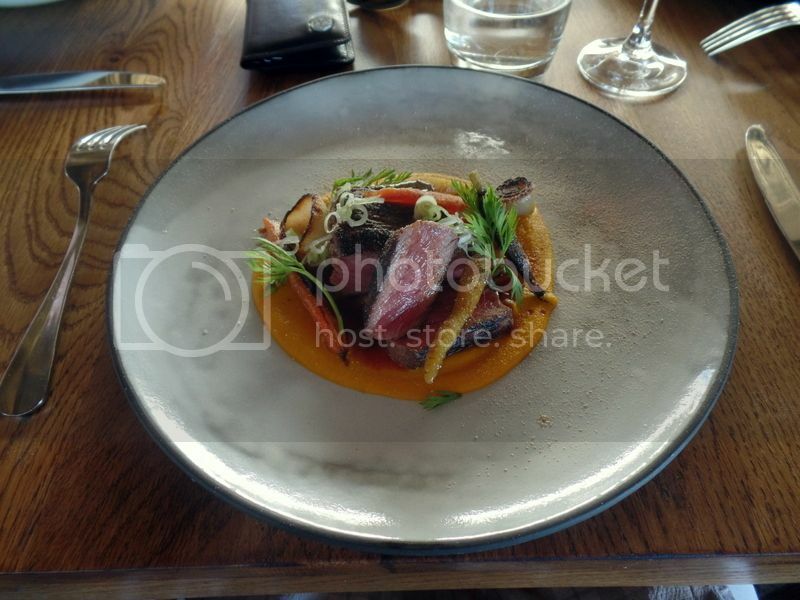 This was amazing main of sirloin with forgotten carrots, carrot puree and confit garlic. Not only was this dish a visual delight but it was incredibly delicious. The sirloin was wonderfully tender and cooked to medium rare perfection. Before dessert itself we were brought a couple of favours from the chef. 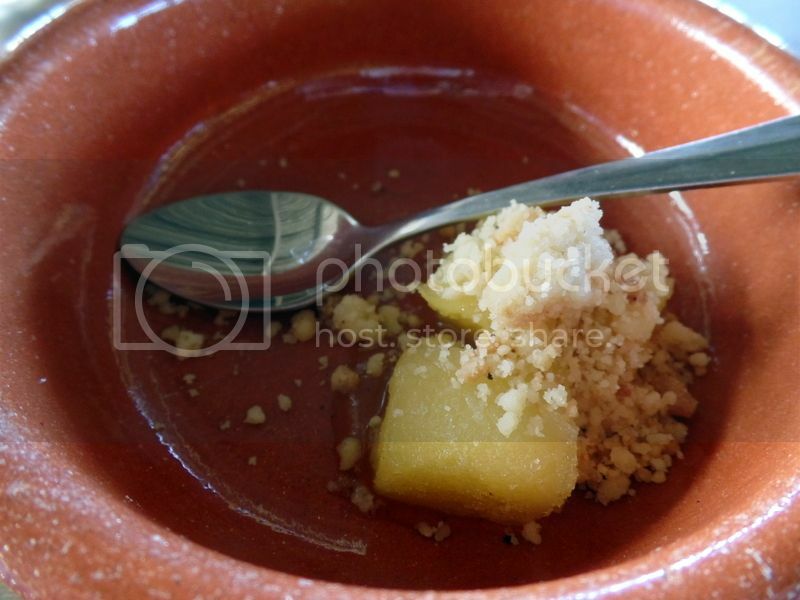 We had this amazing pre dessert of frozen pinapple topped with a buttery crumble. The frozen pineapple was amazing and reminded of me of our Florida holiday where pineapple and grapes were served frozen on kebabs pool side. 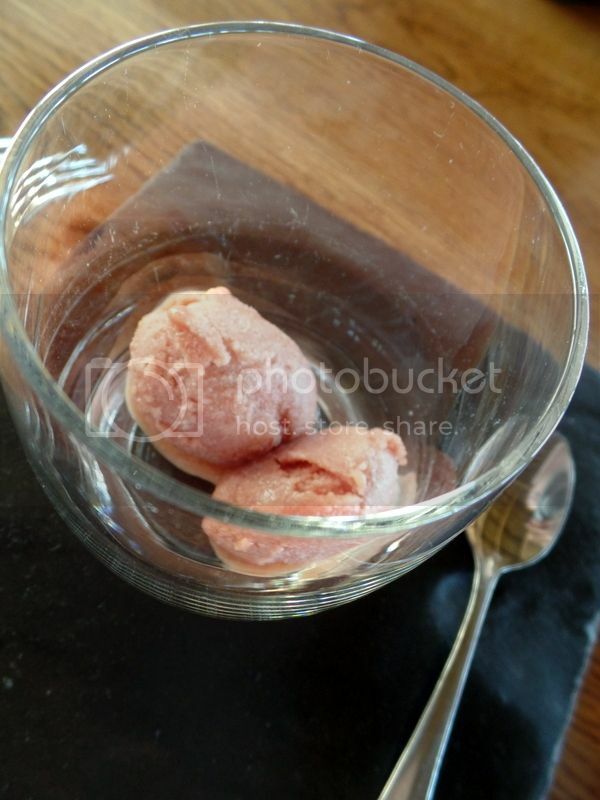 We also loved the palate cleanser of guava sorbet which set me up for my fruit dessert to come! I had the peach soup with peach sorbet and meringues! This was fresh, light and delicious! I love peaches so seriously enjoyed this peach flavour explosion! George often opts for the cheese options when ordering dessert. This time it was a gorgeous baked Camembert with poached apple, celery, walnuts and port. This was also served with melba toasts and onion marmalade. This was a great end to a decadent lunch and could probably be shared between two! 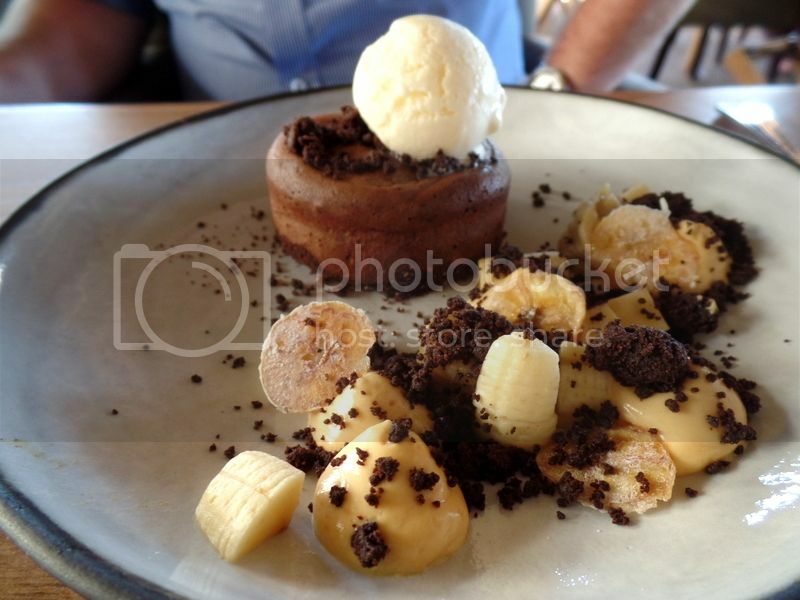 The chocolate fondant came with banana, caramel mousse, almonds and vanilla ice cream. This was the most popular order our table and they weren’t disappointed when it arrived! The chocolate fondant center oozed out when pulled open with a spoon and the creamy vanilla ice cream melted on the rivers of escaping chocolate richness. Our table as a whole are huge chocolate fans and they were praising this dessert between every spoonful!